In 2008 and 2009 the Pet Industry took a dip. Retail Sales still went up but in terms of the amount of Pet goods and services, the consumer actually bought less – just paid more – in each of these successive years. 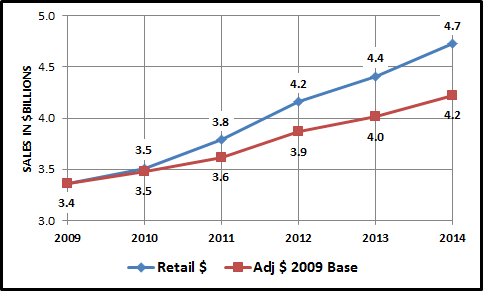 In 2010 this turned around as both Retail $ AND the amount purchased rebounded strongly. We’ll take a closer look at the period from 2009 to 2014 – by industry segment as this recent market performance has a direct bearing on the future. We’ll divide this into 3 Posts: Services, Food & Supplies and Total Market. For this 2009-14 period analysis of this and other segments, we’ll establish our “Base” year as 2009. All changes will be relative to this year’s numbers. 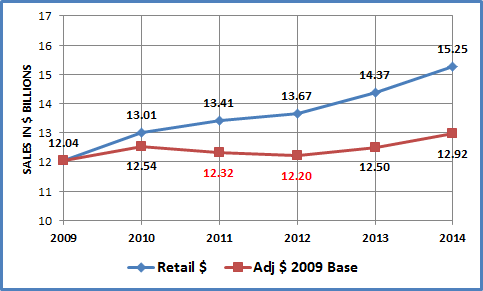 2011 & 2012 – Years of ever increasing prices cause consumer reaction. They bought less in terms of the amount of services – just paid more in two successive years. 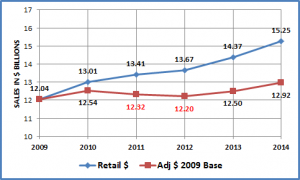 2013 – Market still has not yet got back to 2010 levels in terms of the amount of purchases. 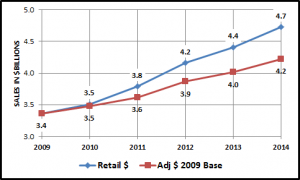 The estimated increase in retail purchases of 6.1% for 2014 seems ambitious. Moreover, the supply segment is seeing a rapid growth in OTC meds and supplements as the consumers look for home remedies. 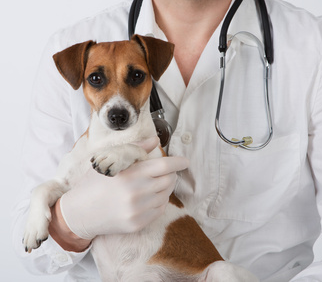 Now we’ll consider Non-Vet Services like grooming and boarding. Only 1/3 of this segment’s growth was from price increases! This is a small but fast growing segment. No indication of hitting a pricing wall…yet. As this segment becomes larger with more participating consumers, pricing pressure may become an issue. In our next Post, we’ll look at the Pets & Supplies and Pet Food Segments.